This gorgeous Lis Simon Bride, Brittany, got married at the beginning of the year to her husband, Tyler. She wore our Hope gown with custom sleeves made by the seamstress at Ladies of Lineage, Bev. Brittany grew up in Virginia Beach, Virginia, and Tyler was born in Atlanta, Georgia. Tyler moved every three years, so he never stayed in one place for very long. While both living in New York City, Brittany and Tyler met at a margarita bar in February of 2015. Brittany and Tyler were on their first trip back to the magical city where they met since moving to Charlotte, North Carolina. They were strolling around Washington Square Park when he proposed, and totally surprised her! Brittany and Tyler got married in Norfolk, Virginia on the 24th on February. 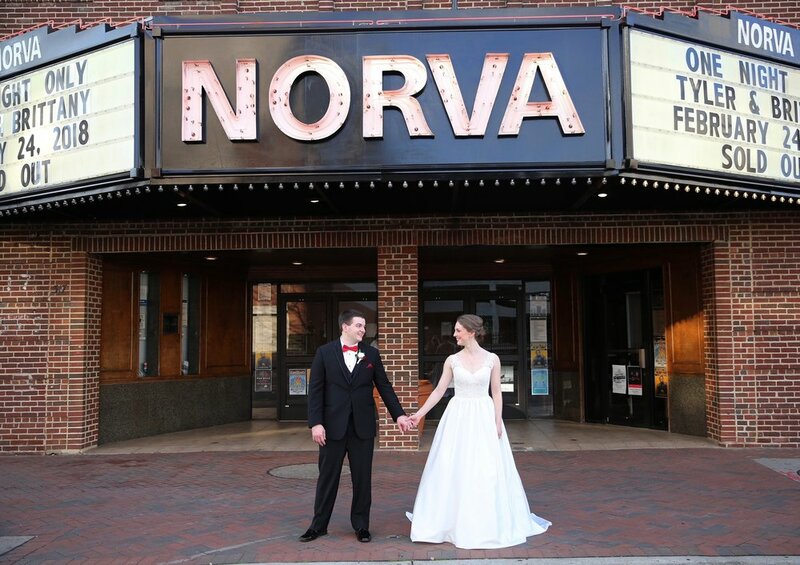 They had a short, sweet, religious ceremony in the Sacred Heart Catholic Church and their reception was held the NorVa. The normal concert venue was transformed into a beautiful, unique dance floor with tables surrounding it for their magical night. Honeymoon Destination: Thailand, Cambodia, and Vietnam. W o r d s f r o m t h e b r i d e.
Trust your vendors and build a team you have fun working with, not that stress you!